CIE Tours has provided over a million travelers with the highest quality vacations since 1932. We offer the largest range of scheduled escorted motor coach tours to Ireland, Britain and mainland Europe with emphasis on quality and value. Our Group Department, which specializes in customized tours, is located in our offices in Morristown, NJ. CIE Tours will assist you in maximizing your group travel plans while minimizing your costs. 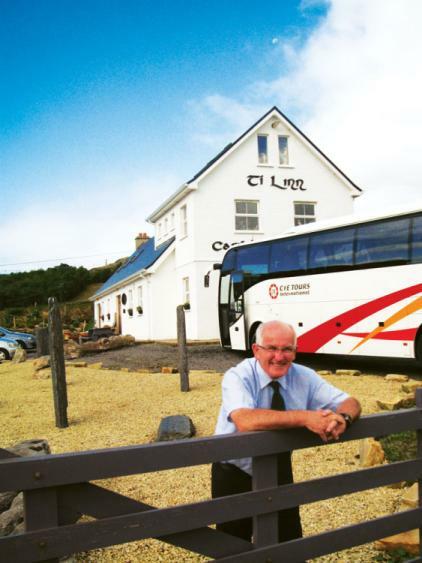 We offer the largest selection of scheduled motor coach tours to Ireland, Britain and mainland Europe. We focus on delivering top quality vacations, using 3, 4 and 5 star hotels, with 4 star being the most popular. As our clients pre-pay their vacations in dollars, they only have to pay for shopping, drinks, lunches and incidentals while on tour. Our team of dedicated professionals offers years of experience in creating successful vacations for groups - financially rewarding for you and memorable for your participants. Choose one of our existing brochure itineraries or allow us create a customized tour to your specifications. For all group travel, CIE Tours offers competitive contract air rates with major carriers serving our destinations. Brochure tours offer you the advantage of guaranteed departures and guaranteed prices on over 30 CIE Tours’ pre-set itineraries that operate throughout the year. 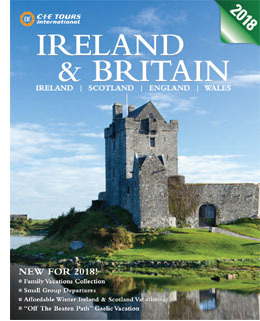 Click for tours to Ireland, Britain, Scotland and Wales. Receive $10 per person discount offered for booking and applying all payments on our online group reservations system. No expiration, for this discount offer is combinable with other group offers date of this offer! If you have a group of 10 or more travelers that wants to do something special, our dedicated Group Department can create or refine any itinerary to reflect your group's interests, needs, time frame and budget. The types of tours that we can offer are endless! The cost of a customized tour depends on the duration, hotels and features selected. We use mainly 3- and 4-star hotels to provide a good value-for-money tour or 5-star with a bigger budget. Special meals or sightseeing can be included wherever you wish. The program is quoted to you as a net rate and we include complimentary tour conductor places in the land-only cost. There are many castle hotels at different price points. Some are 5* top-of-the-line properties but there are also some 4* and 3* castle hotels which offer reasonable rates and still give a wonderful experience of stepping back in time. There are many different types of castles that are open to visit. In Ireland and Wales, castle banquets offer a fun dining experience. As you will have exclusive transportation and services of a driver/guide, we suggest a minimum of 20 paying passengers though a larger group size will make the tour less expensive for each traveler. However, by using a smaller vehicle we can put together a program for 10 or more paying passengers and keep costs down. Why select a CIE Tours brochure program? No optional extras - no hidden costs. What's included in a brochure tour? All the components for a great vacation. We use quality accommodations - mainly superior first class hotel (4-star). Breakfast (full in Ireland and Britain and buffet in Europe) is included every morning. Dinner is served most evenings and some of these dinners are special banquets or cabaret-style entertainment. Every day a fun sightseeing program enables visitors to see highlights and yet enjoy free time for independent activities. How many itineraries do you have available for groups? We have over 40 different motorcoach programs featured in our main brochure and on our website with departures right throughout the year. For administrative purposes, 10 or more paying passengers constitute a group booking on a brochure tour. On these departures, other CIE Tours' clients will be booking on to the same coach. So, if you end up with fewer than 10 passengers, your travelers will join ours and head off for a fun trip. The Sky's the Limit! We use mainly 48-seater coaches. For comfort we prefer to operate with 40 to 44 passengers. If you want an exclusive departure at our brochure rates we require 36 passengers. For few than 36 passengers on an exclusive coach a supplement from our Small Group Collection will apply. What about tour conductor places? Free conductor place or places are offered, depending on group size. Why plan an off-peak trip? Off-season rates make tour prices more attractive - travelers can save up to 30% over high season rates. And remember, Ireland, England and mainland Europe have relatively mild winters, which makes travel enjoyable. What if none of these itineraries suits my group? Then contact one of our Group Department professionals who will be happy to tailor an itinerary to your specifications, taking budget, length of tour and inclusions into consideration. Many travelers realize that they have more fun with a group, especially when all arrangements are handled for them. Is there a special family event to celebrate? Are you a member of a church, club, pub or sporting association. Once you get a core group, we will work with you on the travel program and assist with sales flyers and information. Why select a CIE Tours customized program? Offer the tour as a fundraiser for your local church or organization. What's included in a customized tour? Basically whatever you would like to have. Of course, you will have coach transportation with a driver/guide throughout, hotels and breakfasts. Then you can choose whatever sightseeing, meals and entertainment that appeal to you and your group. Are all castle hotel stays very expensive? There are many castle hotels at different price points. Some are 5* top-of-the-line properties but there are also some 4* and 3* castle hotels which offer reasonable rates and still give that wonderful atmosphere of a historic experience. As you will have exclusive transportation and services of a driver/guide, we suggest a minimum of 20 paying passengers. However, by using a smaller vehicle we can keep costs down and put together a program for 10 or more paying passengers.